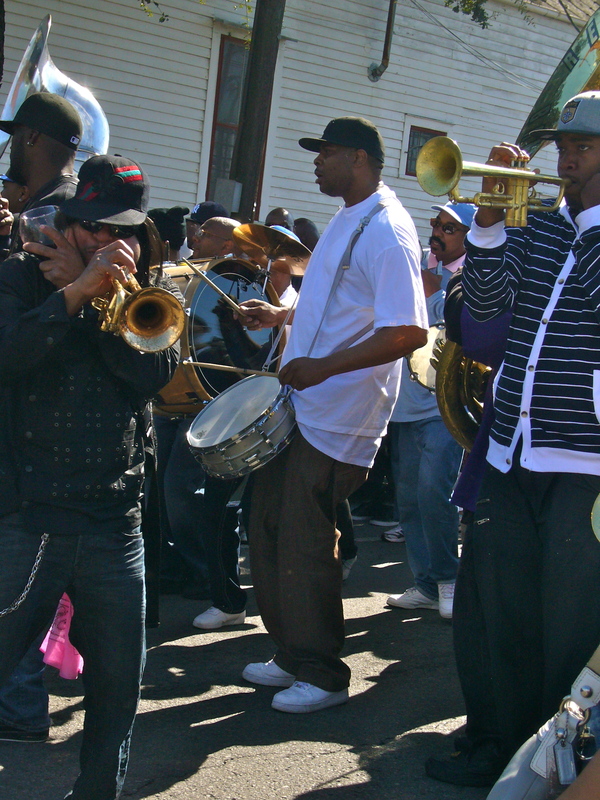 Derrick Tabb in the Sidewalk Steppers second line parade, 2011. Derrick Tabb is widely considered to be the most progressive and skilled snare drummer in a city of many, many snare drummers. Known for his formidable presence in the Rebirth Brass Band and his leadership of the Roots of Music youth program, Derrick grew up in the Treme neighborhood and attended Andrew J. Bell Junior High School. While at A. J. Bell, he began playing with the school band under the direction of Donald Richardson. Soon afterward, Derrick began playing professionally, touring Europe and the Caribbean with a variety of bands. Watch Derrick discuss his early experiences on the snare drum at a Rebirth drum workshop I organized at Tulane in 2009. In the mid-1990s, Derrick founded the Hot 8 Brass Band by combining members of the Loony Tunes with members of his own band, the High Steppers. He was also the second call drummer for many other bands, including Rebirth, and he ultimately replaced Ajay Mallery in 1998. As part of Rebirth, Derrick has brought new repertoire and technical innovations to many of the group’s songs. His snare drum part for Rebirth’s version of James Brown’s 1970 protest song “Talkin’ Loud and Sayin’ Nothin’” integrates a 15-stroke drum roll that would have made Donald Richardson proud, and has become required learning for up-and-coming snare drummers in New Orleans. Watch Derrick explain the drum part to “Talkin’ Loud” and then perform it with Keith Frazier, Philip Frazier, Vincent Broussard, Chad Honore, and Stafford Agee of Rebirth. Following Hurricane Katrina, Derrick established Roots of Music, a free after-school music group that provides musical training to middle-school age children in New Orleans. Tulane students in my course “New Orleans Music” offer tutoring to Roots of Music students.